The Red Dirt dynamos of the super-successful Eli Young Band have hit a major musical milestone with sales of more than 650,000 to date of the group's hit single "Crazy Girl." The single was certified gold for sales of more than 500,000 downloads, and the song has had a terrific average of 40,000 downloads per week since its release. This week, the cut climbed to #18 on the Billboard Country Songs Chart, and it also found a place at #17 on the USA Today/Country Aircheck chart. 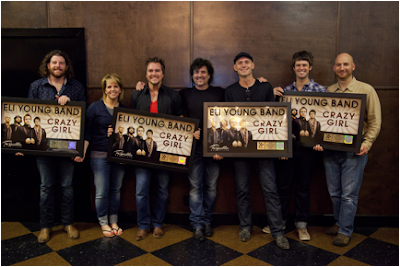 On Monday August 8, 2011 the Eli Young Band attended an event at Republic Nashville where they received gold plaques. Bassist Jon Jones said the accomplishment was a dream come true: "When you walk into a recording studio, you see these gold records on the wall and wonder what it takes to get there." He added: "We're very lucky 'Crazy Girl' is gold. Making a gold record has been one of our goals since we started making music."